Hollywood's Dynamic Duo — not Batman and Robin — Bob Daly and Terry Semel — had jointly run the massive Warner Bros. empire through most of the 1990s. When it came to attracting filmmaking talent, Terry Semel was the good cop, with hotter-tempered Bob Daly being the bad cop. Arguing over final cuts, Daly would tell directors that the studio would put their personal phone numers at the bottom of the end credits, so that if a viewer didn't understand the picture, they could call the director and complain. No one ever took Daly up on the offer. Bob Daly was the youngest of six children. With his father dying when Bob was five years old, the family struggled. While in high school, Bob went to work in a hardware store to help out with the family finances. Movies, television and baseball became his life-long diversions. After attending Brooklyn College and Hunter College in Manhattan, Daly initially thought of becoming a cop, but was too short. Instead, he got himself a gig as a gofer at CBS at $41 a week in 1955. After a stint in the army, Daly found himself in the accounting department at "Black Rock." A constant note-taker, Daly provided his opinions on films CBS was considering buying. Before long, he was helping to purchase TV rights for films, and he was on his way. Daly became chief of television operations, vice-president of the CBS Television Network and vice-president of business affairs. During his time at CBS, he personally OK'ed the production and airing of All in the Family (1971), Dallas (1978), and The Dukes of Hazzard (1979). These shows were so popular that CBS gained the number one spot in the ratings. Daly was recruited by outgoing chairman Ted Ashley to run Warner Bros. in December, 1980. He was installed as chairman of the board and co-chief executive officer. A year later, Daly appointed Terry Semel president and COE. By 1994, Daly did the unthinkable: he and Semel would share the duties of board chair and CEO of the Warner Bros. operation: movies, television, recordings, theatres (Warner Bros., beginning in 1988, held a 50% stake in CineAmerica, parent holding company of Mann Theatres, owner of the Chinese Theatre). 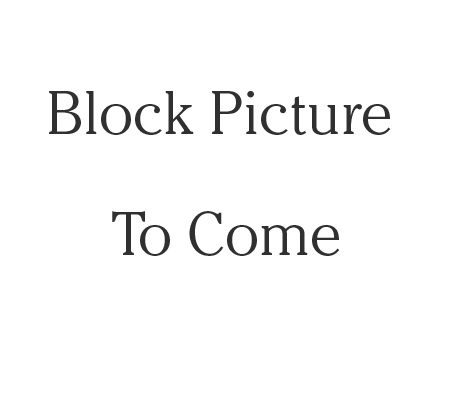 During the Daly / Semel years, Warner Bros. pioneered the model of having outside investors share in the expense of production (the risky part), while the studio retained worldwide distribution rights (the profitable part). Some of the hit films Warner Bros. released under Daly / Semel include: The Bodyguard (released in November, 1982), the Lethal Weapon films (which played the Chinese in April, 1987, August, 1989, June, 1992, and July, 1998), Batman (which played the Chinese in June, 1989), Robin Hood: Prince of Theives (which played the Chinese in June, 1991), The Fugitive (which played the Chinese in August, 1993), Twister (which played the Chinese in May, 1996), The Matrix (which played the Chinese in March, 1999), and The Green Mile (released in December, 1999). In addition, the studio produced three Best Picture winners during those years: Chariots of Fire (released in March, 1981), Driving Miss Daisy (released in December, 1989), and Unforgiven (which played the Chinese in August, 1992). The studio also greatly expanded television production, scoring major successes with shows like Growing Pains (1985 over ABC), China Beach (1988 over ABC), Murphy Brown (1988 over CBS), Friends (1994 over NBC), ER (1994 over NBC) and Tales from the Crypt (1989 over HBO). They also built up the DC comics line of characters as well as the Looney Tunes stable, eventually opening a chain of Warner Bros. Studio stores across the country, beginning in 1991. The stores folded in the US in 2001, but still operate in China (it figures). 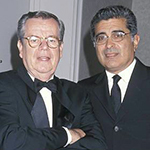 Daly and Terry Semel oversaw the Time / Warner merger in 1989, despite heavy interference from Paramount / Viacom. Daly also oversaw the creation of The WB Television Network in 1993. Warner Bros. produced and/or aired shows like Buffy the Vampire Slayer (1996) and Dawson's Creek (1998). In 1998, Daly, being a fan of the Brooklyn Dodgers (especially the 1955 team), became involved with the Los Angeles Dodgers. He was taking over the storied team which had been sold to News Corp. Both Daly and Semel announced on July 15, 1999, that they would be leaving Warner Bros. at the end of 1999. Now free to work for the Dodgers full time, he became its managing partner, chairman and CEO. He has been quoted as saying that working in the winter on the free agent deals was his favorite part of baseball. During his time with the Dodgers, Daly bought an interest in the team. When the Dodgers were sold to to Frank McCourt in 2004, Daly stepped down. Daly became chairman of Save the Children, an non-profit group devoted to improving conditions for children all around the world. The group's operations expanded during Daly's tenure, reaching an estimated 48 million children and aiding people after Hurricane Katrina and the Haitian earthquake. Daly left the group in February, 2010. 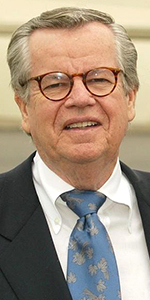 Daly became the chairman of the American Film Institute, where he tries to share all the things he has learned about show "business" over the years. 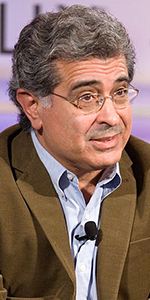 Terry Semel at the Web 2.0 Conference, in San Francisco, California, October, 2005. Photo by James Duncan. Terry Semel is also from Brooklyn. With his father being a coat designer and his mother being a bus company executive, Terry grew up in Bayside, Queens, and attended Long Island University, graduating with a B.S. degree in accounting in 1965. He got a trainee position at Warner Bros. that year. From 1970 to 1972, Semel was domestic sales manager for the CBS controlled Cinema Center Films, handling the release of The Boys in the Band (released in March, 1970), Little Big Man (released in December, 1970) and Prime Cut (released in June, 1972). Semel became vice president in charge of distribution at the Walt Disney Company until 1975, overseeing the release of The World's Greatest Athlete (released in February, 1973), Robin Hood (released in November, 1973), The Island at the Top of the World (released in December, 1974, Escape to Witch Mountain (released in March, 1975). Not exactly Disney's best period. Returning to Warner Bros as head of distribution, he became head of studio operations in 1979. Semel became president and COO of Warner Bros. at the beginning of 1982. Working with Warner chairman and chief executive (and fellow Brooklynite) Bob Daly proved to be such a winning combination that they both served as co-presidents and COO's beginning in 1994. He and Daly both decided not to renew their contracts with Warner Bros., and would depart the studio at the end of 1999. After taking a break, Terry Semel was offered a huge salary to become the chief executive officer of Yahoo! By 2006, he was working there for one dollar a year (and $70 Million in stock options). He created a controversy by allowing the release of what was thought to be confidential Yahoo! user information to the Chinese goverment. Once this was found out, Semel was diffidently regretful over the release. Things are different now. Semel was authorized to attempt to buy both Google and Facebook, but nothing came of these plans. Semel was out as Yahoo! CEO in mid 2007, remaining as chairman. This too ended in early 2008. Semel joined the board of trustees of the Los Angeles County Museum of Art (LACMA). Semel is but one of 16 producers of the Warren Beatty film Rules Don't Apply (which had its premiere at the Chinese in November, 2016). It has been reported that Mr. Semel is suffering from Alzheimer's disease. Mann's Chinese Theatre, Hollywood, California. Terry Semel and Bob Daly Forecourt ceremony, Thursday, September 30, 1999. 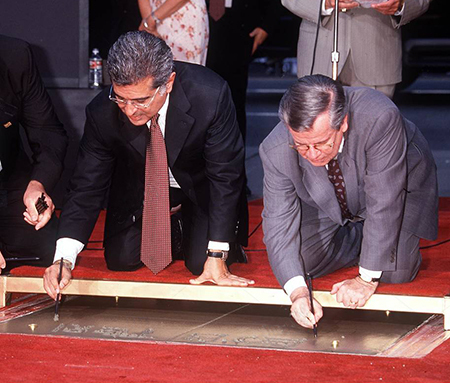 Terry Semel and Bob Daly "sign on the dotted line" cementing their pact with the Chinese Theatre.